These diary models are Casio's least expensive models with a serial communications port. There are less expensive models without a communications port, such as the SF-3xxx series, but organizers without a means of communication should be considered a toy unsuitable for serious use. For the most part these models are very similar in appearance, but the SF-4600C/4700C/4900C models have a silver case rather than dark grey. The SF-4700L/4900L models have a slightly larger display (but same number of characters and lines). The early SF-4300 models were similar to the SF-4600, but with only 32 Kbytes of memory. In most respects these models are fully compatible with the standard range of Casio SF, CSF, and NX digital diary models, but they do not support the Business Card data type of the early high-end SF models, and there are some differences between models in the Expense and ToDo data types. The password protection can be applied to selected items, an advantage if you don't want to have to enter a password to quickly access non-sensitive data. The password protection on Casio diary models is effective against anyone but a well-equipped digital electronics expert  there are no "back doors". The later models all have a display backlight for use in low light conditions, although it should only be used very briefly since it drains the batteries quickly - an important consideration since the batteries are small and expensive. The earliest models (the SF-4600/4600B) do not have a backlight. Communications can be used only to exchange data with a compatible similar diary or PC backup program. There is no general communication capability. These units cannot be programmed. There is no provision for user programming, or for downloading custom programs. There is no graphics or sound capability  text only. These models are small and light enough to slip easily into a pocket. They support all the basic organizer functions. They have sufficient memory for most purposes. They support serial communications for data backup and exchange. They are relatively inexpensive, so they won't cost too much to replace if you lose one or break it. Therefore in many ways they are exactly what most people need in a basic pocket electronic organizer. 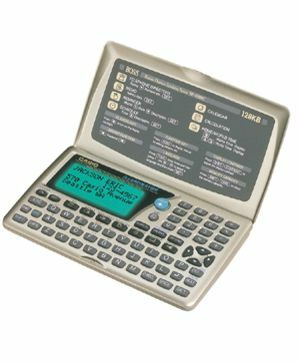 The user interface is not ideal, but it has remained relatively unchanged for more than 10 years, so at least it is familiar to those who have previously owned Casio electronic diaries. The same is true of the serial port, the communications protocol, and the data format - at least for those data types common with older models. You can successfully exchange data between these models and a 10-year old Casio diary using the same old serial cable. Casio has preserved the bad with the good in the user interface of these models. For example, the Insert key inserts one space at a time at the cursor position rather than putting the diary into Insert mode. There is no way to do a non-case-sensitive search, so for example you have to search for both "Lunch" and "lunch". The communications protocol is relatively simple and robust, but it's rather slow and not very efficient by modern standards. It does not support a true synch capability, since one side can't synch matching records with the other. If you send duplicate records to the diary from a previous PC backup, it will create multiple copies in the diary rather than being recognized as duplicate. The small batteries (CR2032) contribute to a slim profile, but they are getting to be very expensive to replace compared to the cost of the organizer. They need replacing approximately every 6 months, and it can cost you 15-20% of the organizer price just to replace the batteries. These compact and inexpensive Casio diary models are probably the best choice in a pocket electronic organizer for the purposes of most people. They handle all the basics well enough, they small and light enough to slip into a pocket, and they are not very expensive. You can pay more, but you won't get more until you arrrive in the $200+ realm of PDAs. The PC serial cable used by these models requires a voltage buffer in the cable, making the cable a little more expensive and more difficult to construct for do-it-yourself types. The recent Sharp YO/ZQ-160/180/190/480 series of electronic organizers are similar in price and capability, but have a simpler and cheaper serial cable (a first for Sharp!). The combined cost of the organizer and the cable could be an important factor in favor of the Sharp models if you don't already have a Casio serial cable. 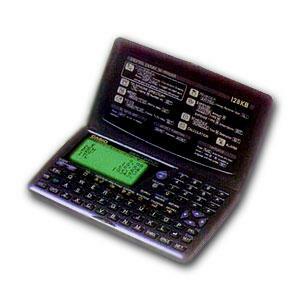 Aside from that, the only significant drawbacks are the cost of batteries, and maybe the fact that it won't impress your high-tech friends like a color Palm PDA. Unfortunately Casio isn't marketing these models very aggressively any more. Only a few are still available. The SF-4985ER is the latest and best of the series.